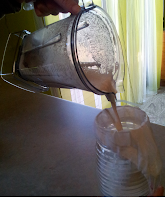 Raw Genesis : How To Make Delicious Hazelnut Mylk from Scratch! How To Make Delicious Hazelnut Mylk from Scratch! So, here you have a picture of the result of all my efforts... that creamy white liquid is, indeed, hazelnut mylk. It could also be called "filbert" mylk, I guess, since the tree was planted before us, and I am really not sure if this is an actual hazel nut or if it is a filbert... it doesn't look exactly like the hazelnuts I'm famliar with (rounder, smaller nuts) but, like my son the botanist-type-guy says, "Mom, there are many different kinds of hazel nut." 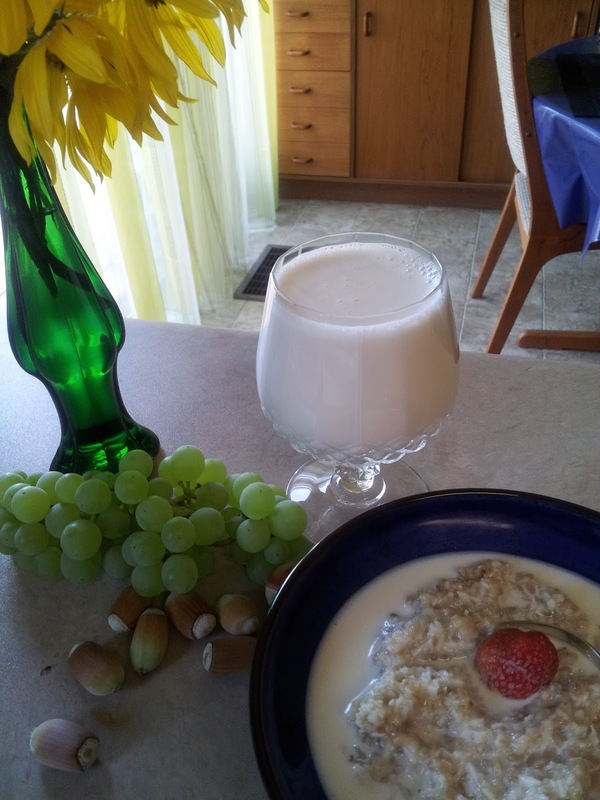 (The grapes grow in our backyard as well as the solitary strawberry on the porridge-- the only one I could locate today). Anyhow, these nuts (hazel OR filbert) taste like hazelnuts, and make great mylk, so we'll just go with that. 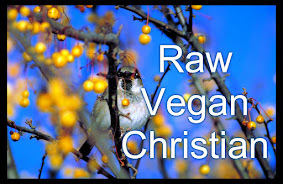 :) You can, of course, use regular store-shelf raw hazelnuts-- but they are expensive last time I checked! If you don't have a nut tree, check out your community to see if there are any U-Pick orchards. Farmers' Markets would be another possibility. I know that the Granville Island Market in Vancouver used to have a huge supply of filberts at this time of the year. 1. Pick the Nuts off the tree when they are mature (in the Fall)-- the nuts that lie on the ground are often empty (??) when you crack them open, or they are moldy. Mold on the outside of the shell is not supposed to reflect the condition of the nut inside the shell-- but I still believe you must be careful. 2. 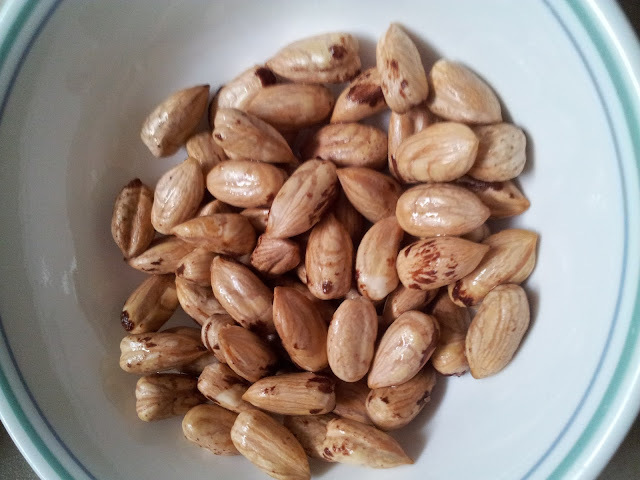 Soak the nuts in water and about 1/4 C. Apple Cider Vinegar- This should clean off the shell and prevent further molding. 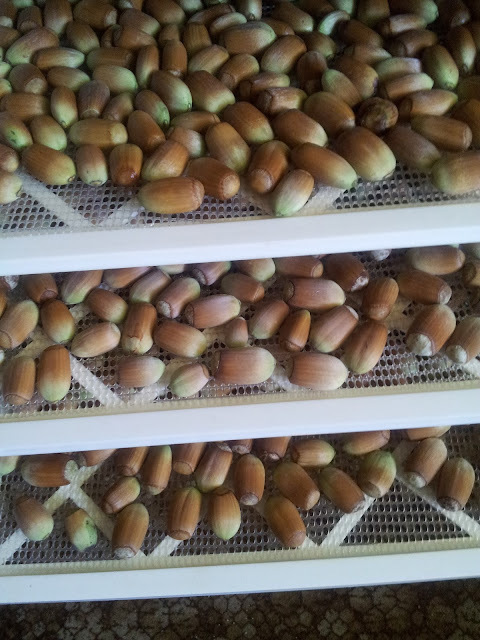 Dry them off between paper towels, and then put them on trays into a dehydrator. Turn to 100 degrees F. and dehydrate for about 10-24 hours. I thought of using my oven, but read that ovens vary in temperature, and most often will not maintain 100 degrees. Besides, a food-dehydrator is much more energy efficient. My neighbour dries them the old-fashioned way-- in a wicker basket behind her husband's LazyBoy in their livingroom-- mind you, it takes about a year for them to dry using the livingroom method. 4. When the nuts are dry, crack the amount you want to use. Store the others somewhere cool and dry. 5. For the Mylk Recipe, cover about 1/2 - 1 C. of cracked nuts with water and set aside overnight or for about 6-8 hours. 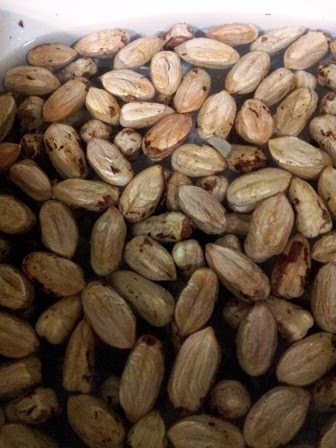 This process of "soaking" will help to begin the 'sprouting' process (although you won't see a long sprout like you do with small seeds, you might see a little sprout beginning at the front of the nut.) Sprouts have all the energy in them that the tree has... lots of energy is being released. Soaking also removes some of the bitterness (from the inhibitors that cover the surface of the nut) and it softens up the nut for blending. 6. Remove Soaks from water and rinse them off. 7. 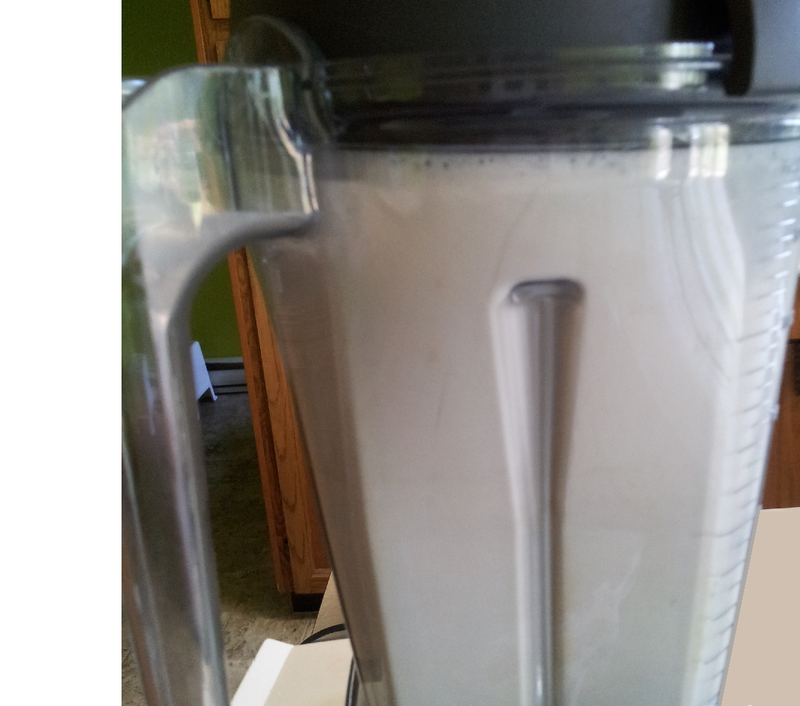 Add to the Blender Canister: 1/2 to 1 C. Soaks, 2 C. Filtered Water (or more, if wanted), 1/8 tsp. Organic Traditions Stevia Powder, Green Leaf, 3.5 Ounces (or 3 dates, etc), a dash of Celtic Sea Salt (optional), and a dash of organic Vanilla (optional). Blend until pretty smooth (not necessary to get every little chippy-chunk smooth because you will be straining). 8. 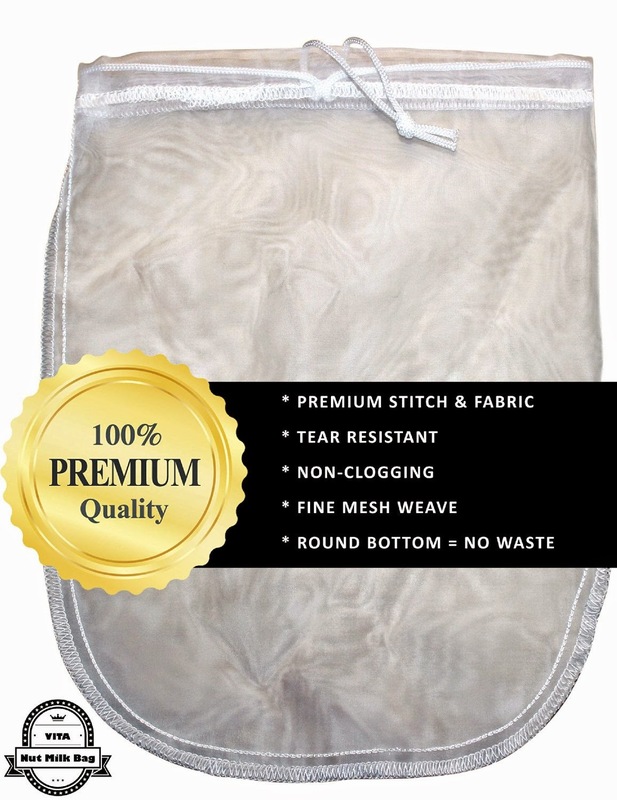 Pour Mylk through a Nut Mylk Bag. Gently massage, or squeeze/milk, the fluid through the bag..
9. Besides the lovely creamy, sweet mylk, you have a gift in the pulp. It can be used in a number of tasty and nutritious ways in other recipes. AND-- you can further dehydrate the soaks and the pulp at 105 degrees to make a great raw hazelnut flour on hand. 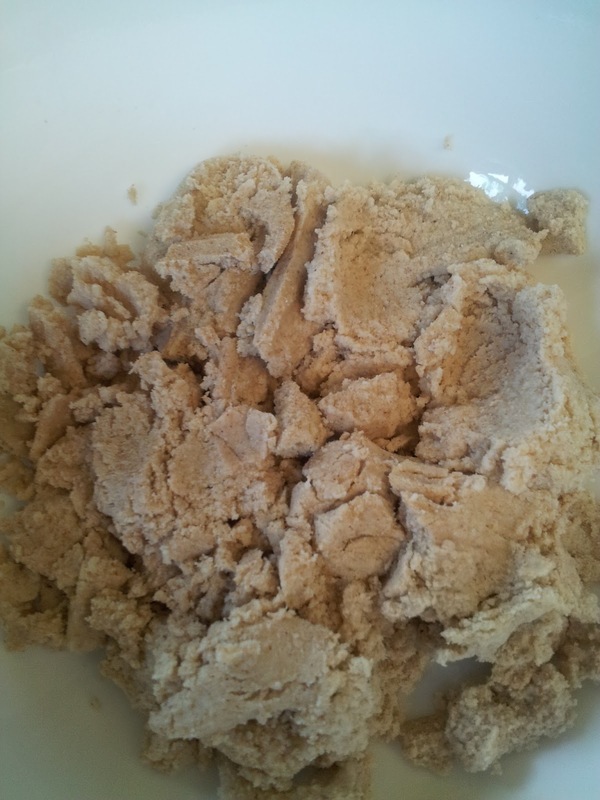 After you have dehydrated the pulp, just run it through a blender to turn it into a mealy flour!